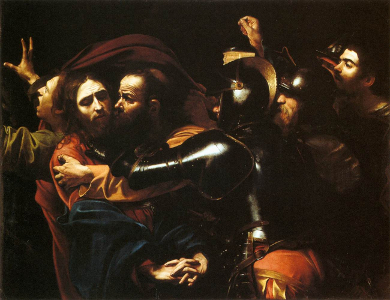 The passiontide paintings of Caravaggio formed the starting point of this, my most sombre work. This wild and often violent spirit painted several scenes of incidents preceding the cruficixion. Perhaps surprisingly, given both its common treatment by artists generally, and indeed this particular painter's fondness for alluding to his own sins on canvas, he never depicted the actual event itself (his two works in the genre are of crucifixions of apostles). However, my piece was never intended to be directly related to Caravaggio's paintings, nor a religious work, nor indeed even specifically to refer to the Passion story. I have no faith and see the "crucifixion" in question here as much more of a general concept. This work, inasmuch as any music can be so specific, is a general exploration of all suffering, and especially that of those over whom hangs some future threat of pain. It is my Winterreise, perhaps. The sixteen individual short movements are akin to a set of preludes (perhaps literally so!). They are untitled which is unique for my Steps series, and span the desolate to the violently brutal. I intend them to be played as a set, though players are free to make their own groupings or selections.